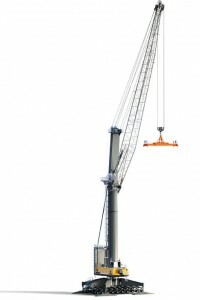 Liebherr Maritime Cranes has launched its new 308 tonne flagship mobile harbour crane – its largest to date. Topping the company’s seven model LHM range, the LHM 800 has a maximum capacity of 308 tonnes and a maximum radius of 64 metres. Offering 100 tonnes more capacity than the next model in the range, it is able to handle container vessels up to 22 rows across. With hoist speeds of 120 metres a minute, the company claims it is able to handle 38 containers an hour in standard configuration. When equipped with Liebherr’s Pactronic hybrid power booster the company claims it can handle up to 45 containers an hour as well as up to 2,300 tonnes of bulk handling per hour. When fitted with Liebherr’s Sycratronic software two LHM 800 cranes can also carry out tandem lifts of up to 616 tonnes. Weighing 745 tonnes the new crane shares the same X-shaped undercarriage used throughout the LHM range, however the wheel sets have been slightly adapted to provide better load distribution. Mounted on a rubber tyred undercarriage, the LHM 800 can also be mounted a rail, a fixed pedestal or a barge.